One of the primary objectives of our order is to perpetuate the memory and to honor the name of Emperor Charlemagne. 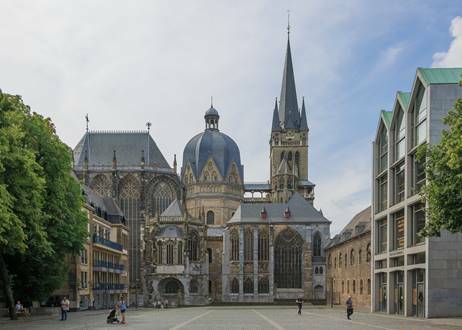 To further this mission the Board has elected to fund a project at Aachen Cathedral. The oldest wooden door of the Middle Ages is currently being restored and we have chosen to contribute needed funds for this work. The door consists of four planks held together by iron fittings. Both sides were covered with leather and painted. Remnants of this are still preserved. Until a few years ago, the door was located in the Hochmünster (upper floor) of Aachen Cathedral in a room near the royal throne, the so-called Karlsthron. Here on the upper floor Emperor Charlemagne attended church services daily during his stays in Aachen. The door closed a small room which led to a long corridor made of wood and stone. This elongated building led to the emperor's palace. We can therefore assume that Charlemagne often walked through this door. The door is to be presented in the cathedral treasury (museum) at the end of the restoration work. For this purpose, a separate, custom-fit showcase with special lighting has to be built. Our support would be identified by the inscription next to the showcase in the collection and in all press. After completion of the showcase we will receive project documentation. If you would like to contribute to this project please send donations c/o Treasurer General Laurie Aldinger, 120 Phoebe Road, Summerville, SC 29483 Thank you so much!